Enter to Win Mt. High Lift Tickets! Enter to Win a Mt. 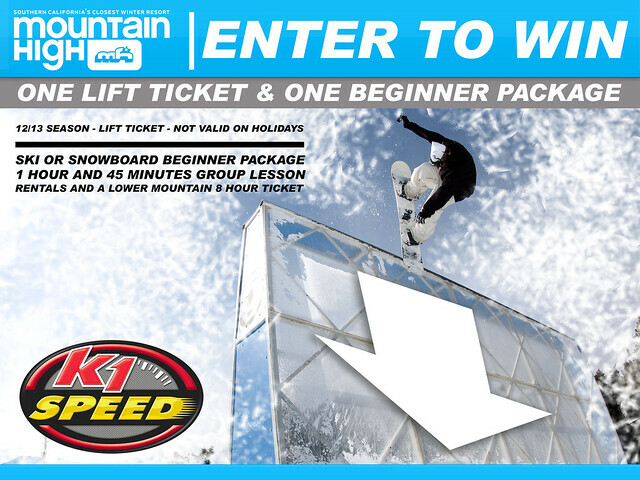 High Lift ticket and Beginner Package at participating K1 Speed locations. A total of four packages will be up for grabs! If you’re deciding to hit the slopes this season come by K1 Speed today! Visit K1 Speed Ontario and Anaheim Saturday, February 9th thru Sunday, February 17th for your chance to win!!! Winners will be announced the week of February 18th. *Holidays: December 22-31, 2012. January 1-6, 19-21, February 16-18, 2013. Dates are subject to change without notice. Good for a ski or snowboard beginner package. Package includes a 1 hour and 45 minutes group lesson, rentals and a lower mountain 8 hour ticket. Check the Mt. High website for operating days and hours.